[Patricio] needed a way to control a bunch of servos for his thesis project. He came up with a USB servo controller (Spanish, here’s the translation) powered by a 40-pin PIC 18F microcontroller. The board connects to the USB port of a computer and supports up to 8 servos with 8 additional digital I/Os. Why all this horsepower? It’s for a Stewart Platform [Patricio] and his partner [Natalia] built. Standard servos are usually limited to a rotation angle of somewhere between 140 and 160 degrees. Sometimes you need a continuous rotation servo, and those are a little more expensive. Every servo is a continuous rotation servo if you disable a the variable resistor as [Valentin] shows us. It’s a simple, if old, hack. It’s new to someone, though. [Mikael] made a little board to attach to the GPIO header of his Raspberry Pi and control up to 8 servos. The board is running a serial interface with a small microcontroller on board. There’s nothing in the way of schematics or code, a testament for why you should always use a good email address when sending something into the HaD tip line. It seems [Mikael] is making a proper board, and we’ll more than happily give it a full post when it’s complete. For over a hundred years, good typists didn’t ‘hunt and peck’ but instead relied on keeping their fingers on the home row. This technique relies on physical buttons, but with on-screen keyboards used on tablets and other touch screen devices touch typists have a very hard time. [Zach] is working on a new project to bring a chorded keyboard to these devices called ASETNIOP. Instead of training a typist where to place their finger – the technique used in most other keyboard replacements, ASETNIOP trains the typist which fingers to press. For example, typing ‘H’ requires the typist to press the index and middle fingers of their right hand against the touchscreen. In addition to touchscreens, ASETNIOP can be used with projection systems, Nintendo Power Glove replicas, and extremely large touchpads that include repurposed nooks and Kindles. If you’d like to try out ASENTNIOP, there’s a tutorial that allows you to try it out on a physical keyboard as well as one for the iPad. It’s a little weird to try out but surely no more difficult to learn than a Dvorak keyboard. 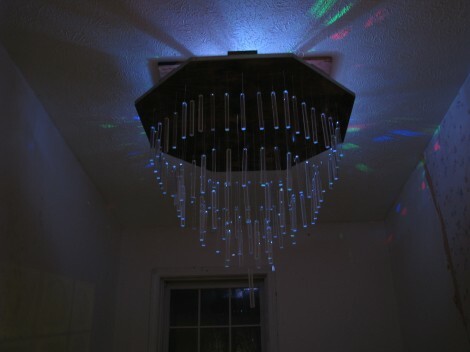 This is [Pierre Cauchois’] digital weather display. Since weather displays are ubiquitous in this day of smart phones in every pocket he went out of his way to give it a unique look. 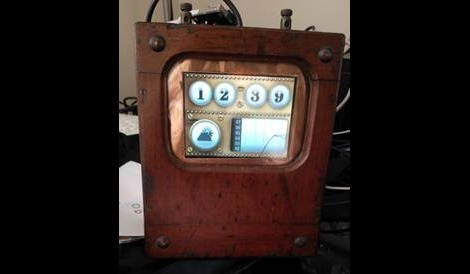 He started with a wooden voltmeter case, swapping the ancient display for a modern LCD screen. He used Gadgeteer components for the retrofit. The images for the LCD are stored on an SD card and displayed on demand. Since the digital bezel will be the same no matter what the time or environmental conditions [Pierre] used the power of the .NET framework that drives the system. He made up an image using magenta for all of the dial openings. This way a sprite can be used just for the changing numbers, weather icon, and graphing area. Looking at all that went into coding the project we think the Gadgeteer components are perfect for those that are well-versed in upper-level languages and don’t really want to deal with low-level microcontroller issues. 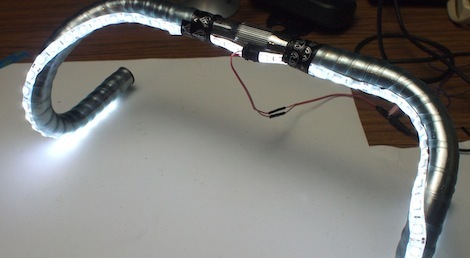 Inspired by a non-existant yet still cool illuminated bicycle handlebar project, [Becky] over at Adafruit came up with her own version of light up handlebars. Not only is her project actually real, they’re also a pretty cool build that brings a little lightcycle ambiance to twilight bicycling. [Becky]’s light up handlebars are inspired by the GLOBARS concept design that made the blog rounds earlier this year. Instead of custom machined aluminum tubing, [Becky] used an Adafruit LED strip neatly assembled with heat shrink tubing and waterproof tape, along with an 8 AA-cell battery holder in a fabric and velcro pouch suspended from the top tube on her bike. After wrapping the LEDs around the handlebars, [Becky] wrapped them in clear handlebar tape she sourced from Amazon. From the video after the break, the 2 meter LED strip on [Becky]’s handlebars verge on lightcycle territory, but sourcing a 6 AA-cell battery holder over an 8-cell will bring the brightness down to a reasonable but still safe level. You can check out [Becky]’s build video after the break.